These Poker Chips are Made in the U.S.A. These top quality Custom Ceramic Poker Chips come in 39mm (10.5 gram, standard size), 44mm, 51mm, and octagonal sizes. They can be printed side to side (on both chip sides) and on the edges of the Chips with any design you choose. We offer the special feature of custom-printed chip edges at no additional charge. Consecutively Numbered Custom Poker Chips are also available. Additionally, due to the single-material composition of our Ceramic Poker Chips, they do not have the weak points that are common in other types of chips. Our Custom Ceramic Poker Chips will not break apart or wear thin - they can endure heavy use. 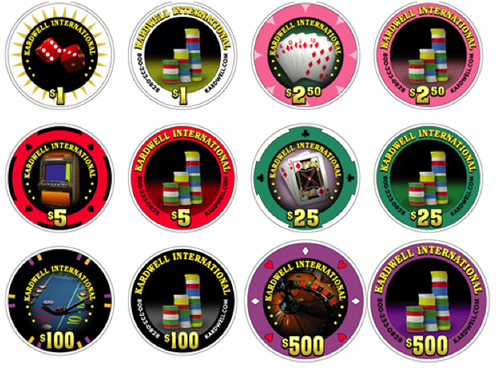 Your full color design is printed directly on these Ceramic Poker Chips. We do not use decals to produce your Customized Poker Chips. The minimum order is just 300 Customized Ceramic Poker Chips. Your satisfaction is guaranteed when your order Ceramic Poker Chips from us. Contact us at 1-800-233-0828 for free samples and a catalog, additional information, volume pricing, or to order. Feel free to browse our other casino products including our Clay Composite Casino Chips and our Casino Night Supplies.